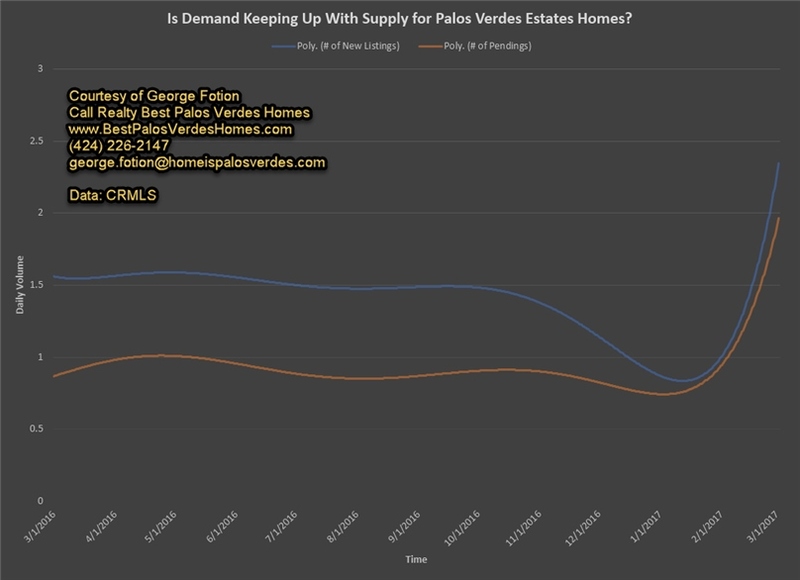 I had a question from a client yesterday remarking on the huge increase in the number of listings for Palos Verdes Estates and they question was simple, “…Is Demand keeping up with Supply for Palos Verdes Homes…” Their premise was that since supplies were increasing dramatically, prices were sure to fall. Is that a question we can answer on its own? Don’t we have to understand the other side of the “see-saw”. What’s demand doing? Clearly if supplies are increasing and demand is staying the same or decreasing, of course that’s going to put downward pressure on prices. But what if demand IS keeping up with supplies? And what if demand if historically, demand is catching up to and getting closer to supplies? That’s exactly what’s happening right now folks. For Palos Verdes Estates homes, not only is demand keeping up, it’s catching up with supplies. Here’s the proof. If you wish to get more wide spread information on a monthly basis on the South Bay real estate market and for all of Palos Verdes homes, just click the chart below. Scroll down for a video presentation on the chart, it won’t take but a couple minutes. So can you see how this information is so vitally important? Think about it, let’s pretend you own a home here in Palos Verdes Estates and you’re thinking of selling. You’re noticing the increase in for sale signs around you and you get worried. What would happen if you met up with a real estate agent that didn’t know their numbers (sadly most don’t – did you know I record this information in my own private spreadsheet on a daily basis and have been doing so since the early 90s?!). You could sucked into pricing your home for too low and cost yourself tens and tens and tens of thousands of dollars. Or what if you’re a buyer and you’ve lost out recently on a couple of homes. Was the agent that was “trying” to help you knowledgeable enough with the numbers to share this information with you? I doubt it. I’ve seen buyers who have got so frustrated losing out on homes that they way overpaid on the next one they offered on. Not smart. You get the pitch here right? Whether you’re buying or selling, you need a broker, like me, that knows the numbers. Only then will you have the advocacy you need to maximize YOUR interests.